Some of you may have noticed that there's a minor sporting event going on in Russia at the moment which appears largely to consist of young men theatrically throwing themselves to the floor as their team mates brandish imaginary cards, excruciatingly painful injuries clearing up in a matter of seconds, and a television replay decision system (VAR, What is it good for? Absolutely Nothing) which appears unable to spot blatant cases of assault and battery in the penalty area. Furthermore, this little tournament - which has already deprived my Touch Rugby team of players for tomorrow evening's match (I despair of the youth of today) - has also provided us with several fine examples of how to show the utmost respect to match officials, culminating in this edifying little scene where Cristiano Ronaldo (so-called Greatest of All Time, ahem) was observed screaming obscenities into the face of the poor referee - an offence which earned CR7 a paltry yellow card. 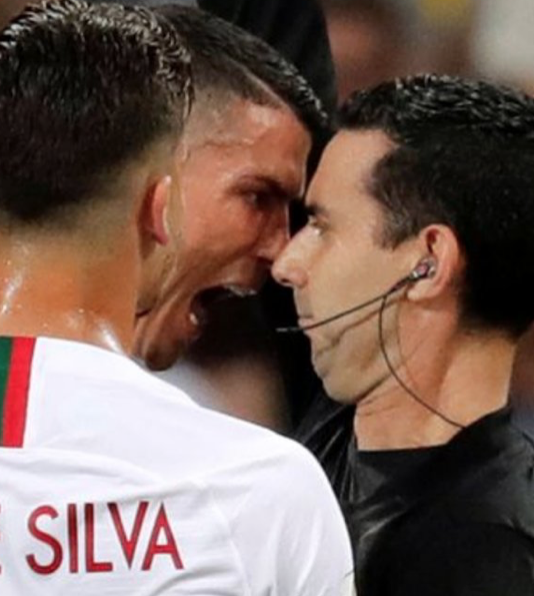 As the so-called (or is that self-proclaimed) G.O.A.T, Ronaldo obviously has no concept of setting a proper example to the next generation or how difficult it now might be for the already beleaguered referees of grassroots football. I know that I have raised concerns in the past about the lack of respect creeping into rugby and the last thing I wish to do is come across as all holier than thou, but at least we are not plagued by behaviour quite so appalling as this. Nor, it is to be hoped, will we ever be.